Some of you might think this is the battle cry for @darrenroos (President of SAP S/4HANA Cloud) / @SDenecken (Senior Vice President of SAP S/4HANA Cloud Product Management & Co-Innovation)…..and it probably is…..however I also think it is true, and when it becomes true for you is just a matter of time (so time is the question). To prove this, let’s try a little mind game – Cast yourself into future and imagine having an On Premise SAP ERP or S/4HANA system in 2025 (even if it is on HEC), you meet up with friends from other companies that have S/4HANA Public Cloud – how does your TCO compare ? how many more skills does your IT department need than theirs ? how much more will they focus on innovation ? What were your answers ? more, more and more ? If so keep reading as you need to start planning your journey to S/4HANA (Public) Cloud now. Your first task is to make sure you really understand what you get with S/4HANA (Public) Cloud. I hear a lot of people saying that they can’t use S/4HANA (Public) Cloud because of scope issues – but this is often based on older versions of S/4HANA (Public) Cloud or a lack of knowledge of the actual scope. One thing to get used to is how quickly things do move with S/4HANA (Public) Cloud – every 3 months we get a whole load of new stuff to digest (1711, 1802, 1805 …..). Below is the summary of the new things from 1711. And for those with a need for more information you can get right into the details via the Best Practice Explorer. 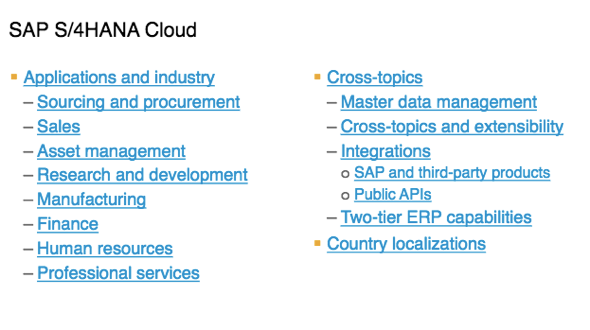 Finally, you need to keep an eye on the S/4HANA (Public) Cloud Roadmap which you can access here, which will show you plans for the next 4 quarters (only 32 pages) – if stuff you need isn’t in this roadmap, engage with SAP and let them know what you need. So hopefully now you have the tools to start to judge when S/4HANA (Public) Cloud will be ready for you, and you are engaged with SAP on the things that you need to be there to make the move. 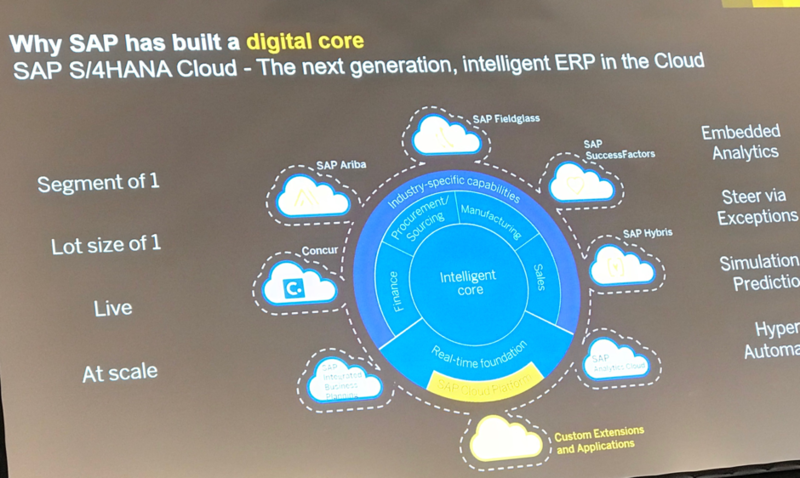 You also need to map your existing On Premise scope for SAP ERP to the newer portfolio of SAP Cloud Apps (including S/4HANA (Public) Cloud). For this you can use the SAP Transformation Navigator to start to plan that journey. Do nothing – This is the path to choose if you believe your current SAP ERP solutions meets your businesses demands now, for the foreseeable future and doesn’t need any hardware / software upgrading for 8 years. Start tidying up – This is the path to choose if you have analysed the scope provided by S/4HANA (Public) Cloud, have decided it doesn’t currently support your scope (and SAP have confirmed this) and don’t want to learn any new skills to prepare you for S/4HANA (Public) Cloud. In this option, you would work through your existing on premise scope removing / cleaning data and reviewing / removing custom code. The more of this you can do the easier the final move will be. Get some HANA / SCP Expertise – This is the path to choose if you want to tidy your system and get used to what SAP HANA can provide to you. This will smooth the eventual journey to S/4HANA (Public) Cloud and if you get some of your HANA experience in SCP you can start to understand the difference between running ERP on HANA (Suite on HANA) and using the power of all the engines that are available in native/full-use HANA plus the SCP capabilities aka Leonardo. Get to S/4HANA Enterprise Management On Premise – This is the path to choose if you see features in the on premise S/4HANA system that are not yet available via S/4HANA (Public) Cloud. To best prepare for the eventual move to S/4HANA (Public) Cloud you might want to consider starting on premise with a new S/4HANA system and trying to stay within the Best Practice Scope Items where you can. Make sure SAP know where you can’t fit into the S/4HANA (Public) Cloud Scope so they can feed this into their planning. Get to S/4HANA Cloud – This is the path to choose if your research shows you that S/4HANA (Public) Cloud has the scope you need now. For this you will need to migrate the data from your on premise system(s), so the cleaner/smaller this is before you start the better. I hope you enjoy your journey – which paths are you choosing ?